Location: Scotts-MiracleGro Turfgrass and Landscape Research Facility in College Station, TX. Download the flyer with pricing information and more by clicking HERE. REGISTER for the short course here. 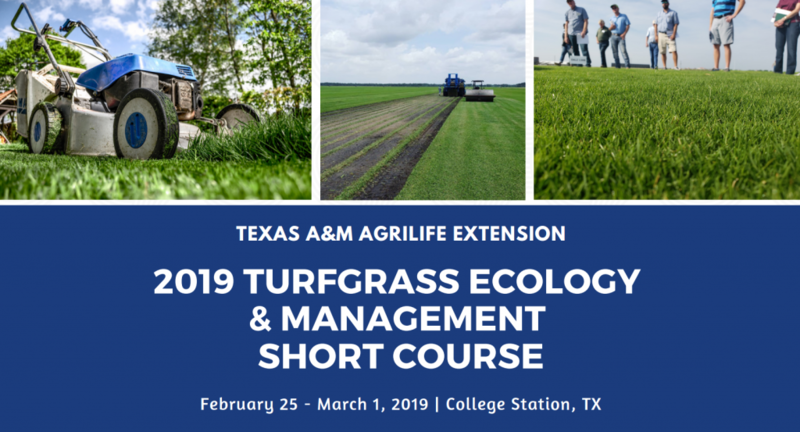 This year, Texas A&M is partnering with the Texas Turfgrass Association (TTA) to offer their Certified Professional Turfgrass Managers (CPTM) exam at the end of the turf portion of our course (Thursday, February 28). The CPTM exam is not required for short course attendees. It is a separate, but extremely valuable offering. Texas A&M believes strongly in the TTA organization and what it offers to turfgrass professionals throughout the state. At our short course, we plan to offer a modified exam for attendees that reflects the short course lectures that you will sit through throughout the week. Essentially, this will allow all attendees to “hit two birds with one stone” – take the TAMU Turf Short Course, and complete the CPTM exam through TTA. As the CPTM exam is separate, there is an additional fee associated. However, for short course attendees, TTA is willing to offer special pricing that includes both the cost of the exam and a 1-year TTA membership. This is normally a $175 value that they are willing to offer for $75 total. To learn more about TTA, visit https://texasturf.com/. To sign up to take the CPTM exam and speak to TTA President Katie Flowers about a TTA Membership, please click the following link and fill out the corresponding form. A light breakfast (e.g., fruit, donuts, coffee) will be included each morning, and lunch will be provided daily. Additional snacks and beverages will be available throughout the day. Participants are responsible for their own dinners. Registration will be available by November 9, 2019. Visit here for more information, subscribe to our email listserv (home page), or follow us on Twitter for regular updates.